Association mapping identified quantitative trait loci (QTLs) and the markers linked to pre-harvest sprouting (PHS) resistance in an elite association mapping panel of white winter wheat comprising 198 genotypes. 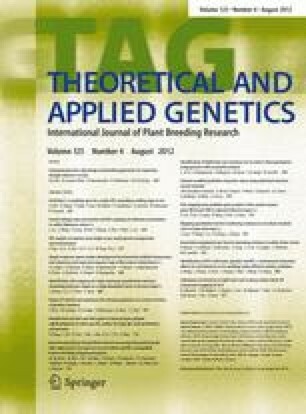 A total of 1,166 marker loci including DArT and SSR markers representing all 21 chromosomes of wheat were used in the analysis. General and mixed linear models were used to analyze PHS data collected over 4 years. Association analysis identified eight QTLs linked with 13 markers mapped on seven chromosomes. A QTL was detected on each arm of chromosome 2B and one each on chromosome arms 1BS, 2DS, 4AL, 6DL, 7BS and 7DS. All except the QTL on 7BS are located in a location similar to previous reports and, if verified, the QTL on 7BS is likely to be novel. Principal components and the kinship matrix were used to account for the presence of population structure but had only a minor effect on the results. Although, none of the QTLs was highly significant across all environments, a QTL on the long arm of chromosome 4A was detected in three different environments and also using the best linear unbiased predictions over years. Although previous reports have identified this as a major QTL, its effects were minor in our biparental mapping populations. The results of this study highlight the benefits of association mapping and the value of using elite material in association mapping for plant breeding programs. The online version of this article (doi: 10.1007/s00122-012-1872-0) contains supplementary material, which is available to authorized users. PLK acknowledges Department of Science and Technology, Govt. of India for the award of BOYSCAST Fellowship and also the Vice Chancellor MPAU, Rahuri. We also gratefully acknowledge Hatch project 149502, Wheat CAP; USDA-NIFA NRI CAP Grant No. 2005-05130), and the Triticeae Coordinated Agriculture Project (USDA-NIFA, NRI CAP No. 2011-68002-30029). Thanks are also due to three anonymous reviewers for very thorough and constructive suggestions.